The Magnetron is a vacuum tube which is used in the generation of microwaves of high power. Its working principle is based on the interaction between electron stream and magnetic field. First Magnetron Tube was invented in 1940 at England's University by John Randall and Harry Boot. The Magnetron Tube works on DC (Direct Current) power. It consists of anode and cathode poles and a permanent magnet. 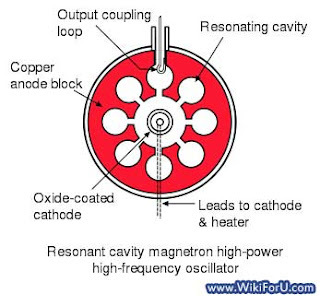 Magnetron Cavity is used in RADAR and Microwave Ovens. As stated above, a Magnetron tube is constructed of a vacuum tube having two electrodes i.e. Anode and Cathode and one permanent magnet. Both electrodes are cylindrical in shape and cathode is surrounded by the anode. Actually, cathodes are the cavities which are in cylindrical shapes also. The permanent magnet and both electrodes are placed in such a way so that the magnetic field of permanent magnet and electric field of cathode are perpendicular to each other. The cathode is into center of the chamber or the cylinder. There are cylindrical cavities around the cathode and these are open along their length and connect the common cavity space. The output of the Magnetron is drawn from any one of the cavities by a co axial line or by using a Wave guide. The output coupling loop gives output to cavity resonator which in turns connected to a wave guide. An antenna is connected to a wave guide to extract a portion of the field. The wave guide is then connected to the load, which may be a cooking chamber (in case of microwave oven) or a high-gain antenna (in the case of a radar) . A constructional diagram of Magnetron is given above. The cavities of a Mangetron Tube consists of hot cathode in which high negative potential is created with high voltage DC power. When Cathode emits electrons, they start travelling in vacuum. There path depends on the strength and direction of the Magnetic Field and Electric Field. The magnetic field causes the electrons to get attracted towards positive anode and starts to spiral in a circular path. Then they sweep past the openings of the cavities which are open along their length. Then these electrons induce high frequency radio field in the cavity due to which electrons got bunched into groups. Then this field goes into output coupling loop which in turns connected to wave guide or antenna depending on the output requirement.